Despite various delays in the construction of the building due to bad weather, shipping issues, and wall cave-ins from quicksand (Crawford and Stearns 14), Smith’s Opera House opened a mere four days later than expected on October 29, 1894 (McNally 16-17). The opening performance was the play, Monte Cristo, an adaptation of Alexandre Dumas’ The Count of Monte Cristo, starring James O’Neill. A famous actor of the time, James O’Neill was the father of the famous playwright Eugene O’Neill, whose highly influential plays affect American theatre to this day. Although Eugene is more often remembered today, his father was still extremely successful. He was seen as a talented actor, and his performance in Monte Cristo drew crowds like nothing else (“Opera House Notes”). 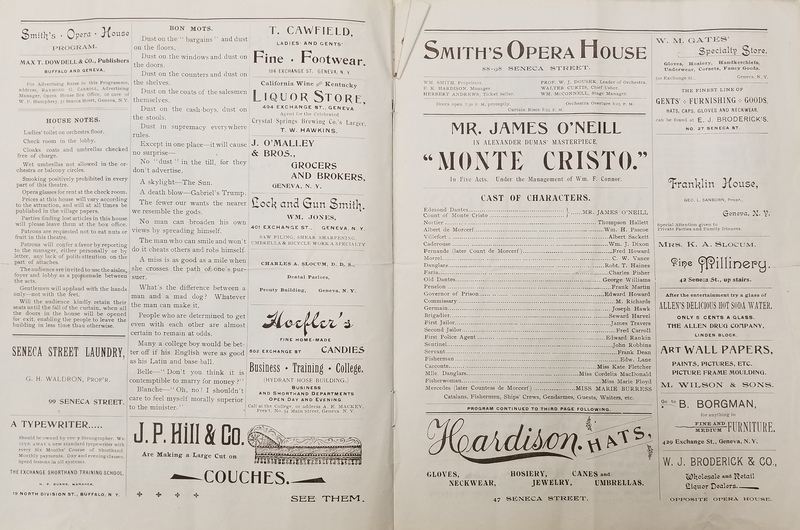 Here is a picture of the cover of the original program for the October 29, 1894 performance of Monte Cristo held at the Smith Opera House. At its center is a picture of James O’Neill. Courtesy of the Geneva Historical Society. Unfortunately, the play was also a curse for James. As his son remembers, “the enormous success of Monte Cristo kept him from doing other things” (Writer’s Program 110). Whenever James acted in any other play, he was unable to garner the crowds and money that he did as the Count, even though he would still earn praise for his other endeavors (Writer’s Program 110). In order to provide for himself and his family, James continued to perform in Monte Cristo. By the time he performed at the Smith, he had reportedly played the part of the Count over 3,000 times (“Opera House Notes”). Artistically this took a huge toll on James and so, as Eugene adds, “in his later years he was full of bitter regrets. He felt Monte Cristo had ruined his career as an artist” (Writer’s Program 110). 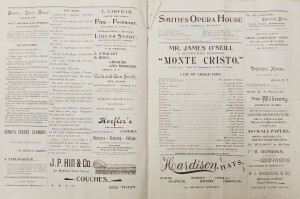 Typical of his performances, James O’Neill in Monte Cristo at the newly built Smith’s Opera House was a huge success. The Geneva Gazette’s headline a few days later read, “Opening of the Smith Opera House. Every Seat Filled. ‘Standing Room’ Only for Late Comers,” (McNally 17) and a review from the Geneva Advertiser thought “Mr. O’Neill’s company was at its best, and they gave a vivid version of that highly dramatic play,” (“Smith Opera House Opening”). At the same time, though, James O’Neill and Monte Cristo were seemingly overshadowed by the huge success of the opera house itself. Genevans were thrilled to finally have a new, large entertainment venue. After the second of the five acts of Monte Cristo had finished, a Mr. S. F. Gascoigne stepped onstage from his box in order to praise William Smith for the gift he had given Geneva. 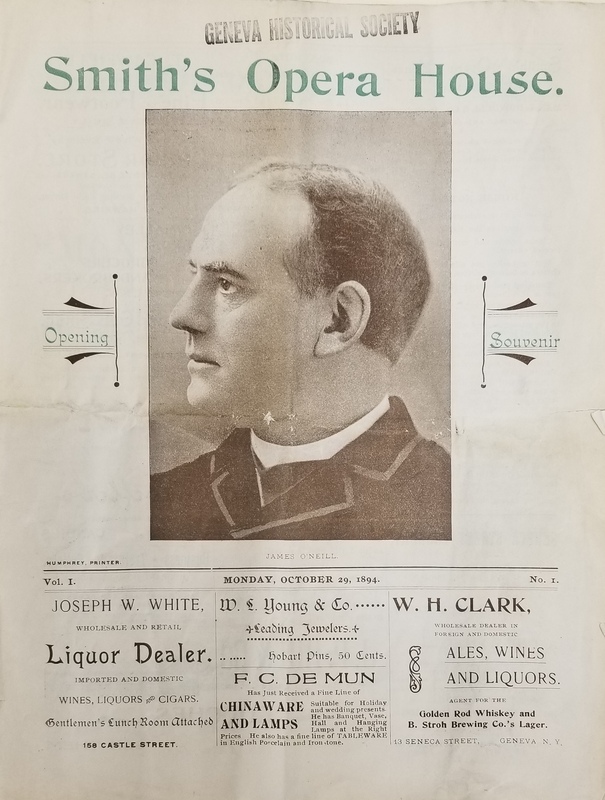 He likened the opening of the opera house to “awakening from a horrible nightmare into the visions of a beautiful dream” (“Smith Opera House Opening”). Smith had done his best to remain humble that night by quietly taking an unremarkable seat in the audience during the overture, but was met with “an ovation of hand clapping that fairly drowned the music of the orchestra” (“Smith Opera House Opening”). It would therefore be an understatement to say that Geneva was thankful for William Smith for having the opera house built. One can only imagine the excitement that was in the air that night James O’Neill came to town. Here are a few pages from the inside of the original program. Above is the cover. Courtesy of the Geneva Historical Society. McNally, Charles. The Revels in Hand: The First Century of the Smith Opera House October 1894 – October 1994. Finger Lakes Regional Arts Council, 1995. Monte Cristo. 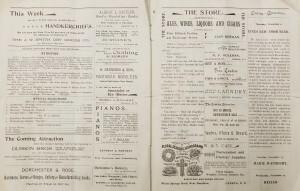 Program, Smith’s Opera House, 29 Oct 1894. Geneva Historical Society archives, collection 78, box 1, folder 11. “Opera House Notes.” Geneva Advertiser, 9 Oct 1894, pp. 2. Rochester Regional Library Council. NYS Historic Newspapers, http://nyshistoricnewspapers.org/lccn/sn84031546/1894-10-09/ed-1/seq-2/. 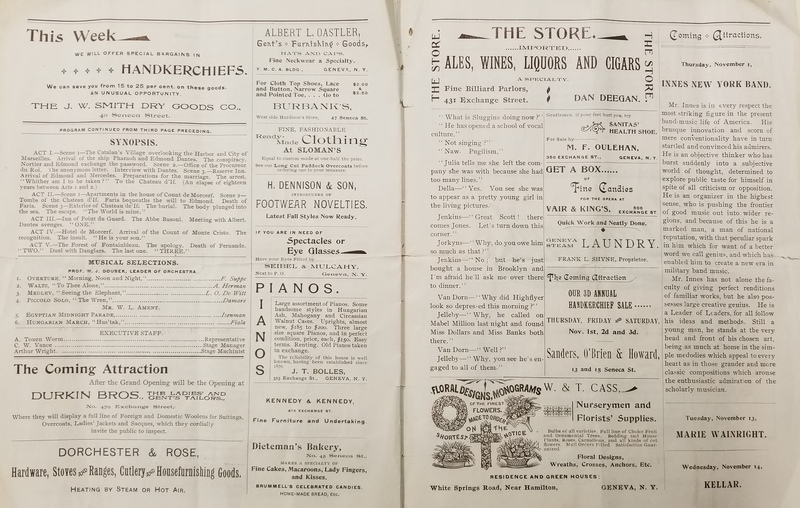 “Smith Opera House Opening.” Geneva Advertiser, 30 Oct 1894, pp 2. Rochester Regional Library Council. 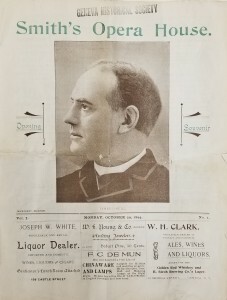 NYS Historic Newspapers, http://nyshistoricnewspapers.org/lccn/sn84031546/1894-10-30/ed-1/seq-2/.